BEAVERTON, Ore., Feb. 13, 2018 /PRNewswire/ -- Tektronix, an industry-leading innovator of video test, monitoring and diagnostics solutions, has announced interoperability with its video quality assurance solutions and Amazon Web Services (AWS) Elemental MediaLive, AWS Elemental MediaConvert, and AWS Elemental MediaPackage. The combination gives video providers, including pay TV operators, broadcasters and OTT providers, a scalable and cost-effective means to convert and package video content into various formats, while ensuring quality across the video workflow from acquisition to delivery. Customers turning to these services can now use Tektronix Sentry for monitoring live streaming video along their workflow, from AWS cloud ingest through to content delivery networks. For file-based analysis, Tektronix' Aurora file-based QC ensures compliance of media files on Amazon Simple Storage Service (Amazon S3) to meet quality, regulatory and workflow requirements. "To be successful on the cloud, content providers need to have the ability to diagnose and isolate issues along the workflow," said Charlie Dunn, general manager, video product line, Tektronix. "We are excited to be collaborating with AWS to deliver QC solutions." Sentry Real-Time Monitoring -- AWS Elemental MediaLive is a real-time video encoding service and works in combination with AWS Elemental MediaPackage for content origination, just-in-time packaging, and encryption. 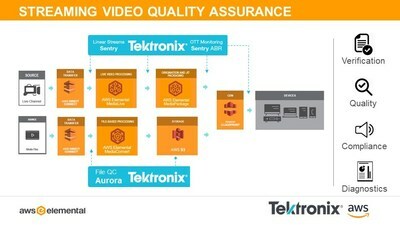 The Tektronix Sentry monitoring and diagnostics solution for these new products (as well as the Amazon CloudFront CDN) delivers end-to-end measurement and reporting on issues in live streams that impact customers' viewing experience the most, often before they lead to actual customer disruption. Sentry also offers true video quality of experience (QoE) and picture quality analysis on encrypted networks. The software-based solution can be deployed where it's needed in cloud or hybrid network environments. Aurora File-Based QC -- AWS Elemental MediaConvert is a file-to-file video transcoding service with packaging and encryption capabilities and can function as a standalone service or within a larger video workflow. By using Aurora with AWS Elemental MediaConvert, video providers can automate file QC on Amazon S3 storage to ensure a reliable and high quality VOD viewing experience. For OTT services, Aurora's perceptual video quality and TekMOS picture scoring reveals any encoding and alignment issues to ensure a great viewer experience. Depending on how workflows are structured, Aurora can perform QC testing of files in Amazon S3 folders from a web-based user interface, through an API or through Amazon S3 watch-folder automation.